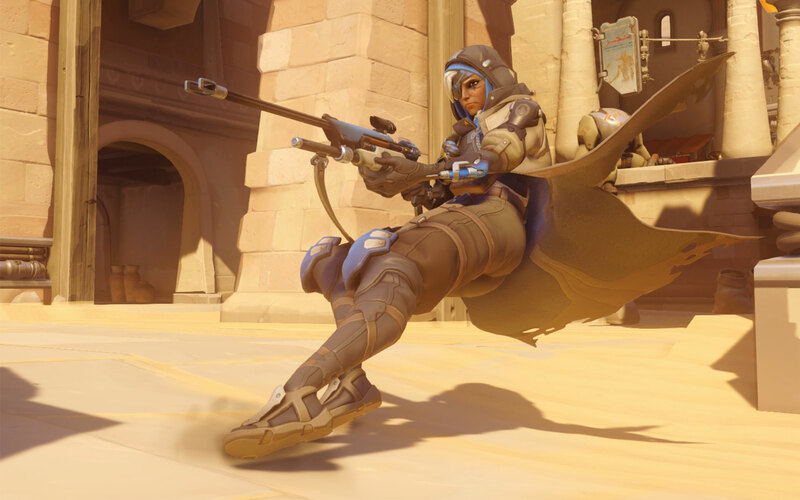 Blizzard has released the latest update for Overwatch on PC and it includes the new support hero Ana. The changes will be implemented on PlayStation 4 and Xbox One in an upcoming patch. For now, consider the PC patch notes below as standard – barring any platform-specific additions or changes. McCree fans will be pleased to know his effective distance has been increased, making his range similar to Soldier: 76’s. Changes to Ultimate Cost have also been made to Solider: 76, Roadhog, Bastion and Lucio. Along with general updates and bug fixes, the promised changes made to D.Va, Mercy and Zenyatta, as previously reported, have been applied. The full patch notes are below, and we’ve included commentary from Blizzard on the changes made to these particular heroes. Competitive Play: Competitive Play matches can now only have one of each hero per team. A new resource meter has been added. This meter will deplete while Defense Matrix is active and then recharge when it’s not in use. Developer Notes: D.Va isn’t being selected as often as our other tanks, and we feel a lot of that stems from the underperformance of her damage absorption abilities. So, we’ve reconfigured her Defensive Matrix, making it more flexible and giving players the ability to use it more often. We’ve also given Self-Destruct a little more oomph, because it felt slightly underwhelming when compared to many of Overwatch’s other ultimate abilities. Developer Notes: Mercy’s ultimate is one of the most powerful abilities in the game; however, players would often fly into the fray and die while using it. With this update, Resurrect will now take a bit longer to charge, but Mercy will be a lot safer when activating the ability in the middle of combat. Developer Notes: While Zenyatta has never had the healing abilities of Lúcio or Mercy, he made up for it by dealing more damage. However, his lack of mobility and low health has meant he’s struggled to find a place in many games. To increase his effectiveness, we’ve made several changes, the biggest of which is an increased shield pool. This will allow him to go head-to-head with more enemies. The Orb of Harmony and Discord changes are also a quality of life change, helping Zenyatta move his orbs around and apply their effects more quickly. And lastly, we’ve increased Transcendence’s healing throughput. This ultimate was designed to be the most effective against sustained, high-damage fire and least effective against short, high-damage bursts (like D.Va’s or Junkrat’s ultimates). But, due to the amount of healing it provided, there were times when it was possible for even sustained fire to overcome Transcendence’s output. We’ve made the heal powerful and also allowed Zenyatta to move around more quickly while it’s active.